As you all probably know by now, my husband and I develop a lot of our own recipes. We also have recipes collected from friends and family members, magazines, and library books. 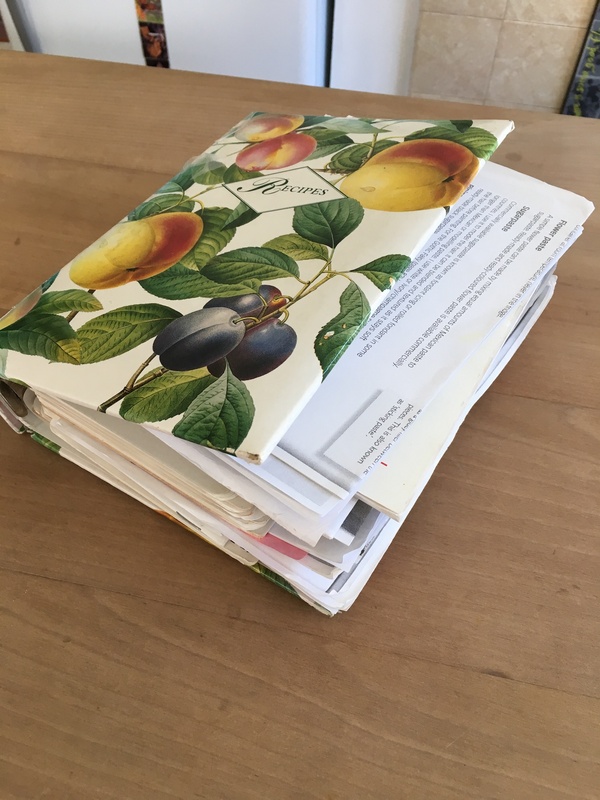 For over twenty-five years, we collected all these recipes in a notebook that was never designed to manage so much paper. I looked for a replacement for a long time and found nothing suitable. Nothing marketed as a recipe notebook, that is. When I got creative (read desperate) I found the perfect solution. I added some homemade card stock tabs to help me organise, and voila—a perfect recipe notebook, with plenty of space for all our recipes. 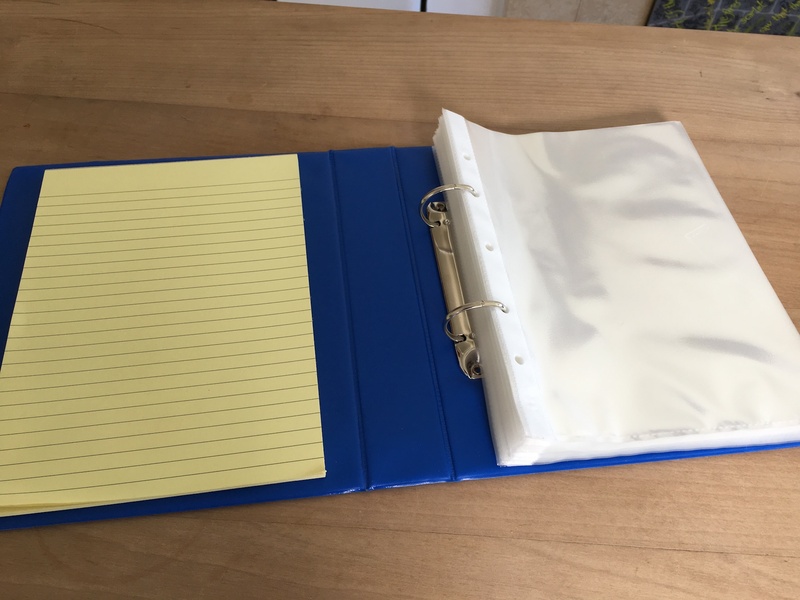 I can slip photocopied recipes into the sleeves where they’re visible, not wadded together in the back of the notebook like they used to be, and I didn’t even have to copy the handwritten recipes—I just slipped the pages from the old notebook into the sleeves of the new. And the bonus is that recipes are now protected from the inevitable spills. Chilli peppers are one of the prettiest plants in the garden. It’s no wonder there are so many varieties grown largely for their ornamental value. But I appreciate my chillies for their kick as well as their glossy leaves and cheerful fruit. Unfortunately, chillies are tropical plants, and many varieties need a longer, hotter growing season than I can provide here, even under cover. Two varieties, however, regularly produce well. Jalapeño Early—I can’t grow normal Jalapeños, but this variety is a week or two quicker to produce, and that’s enough. One of my favourite chillies because its low heat level (2,500-8,000 Scoville Heat Units) means you can load a dish with them and enjoy the other flavours they impart along with the heat. Thai Super Chilli—At 40,000 to 50,000 Scoville Units, these peppers are significantly hotter than Jalapeños. Just one of these little gems gives a nice kick to a dish. I particularly like these chillies because they dry well in beautiful strings hanging in the kitchen. They’re easy to grow and preserve, and they lend beauty to the garden and the kitchen all year. A couple plants of each of these peppers is plenty to grow a year’s supply of spicy goodness, but you know I can’t stop there. I usually plant at least one other mildly spicy pepper. this year, it was Cherry Large Hot. 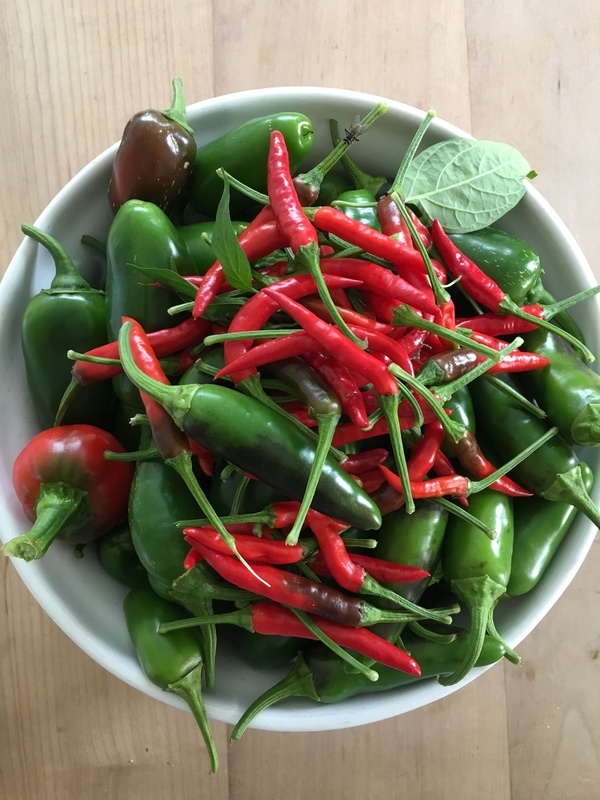 Similar to Jalapeños for heat, these chillies really serve no purpose for me except as a beautiful red contrast to the green Jalapeños in salsas and pickled peppers. Good enough reason for me to plant them! It is the autumnal equinox, and fittingly, our weather today has started out pure summer heat, and is predicted to turn to wintery wind and rain later on. I can see the clouds piling up to the south as the front approaches. 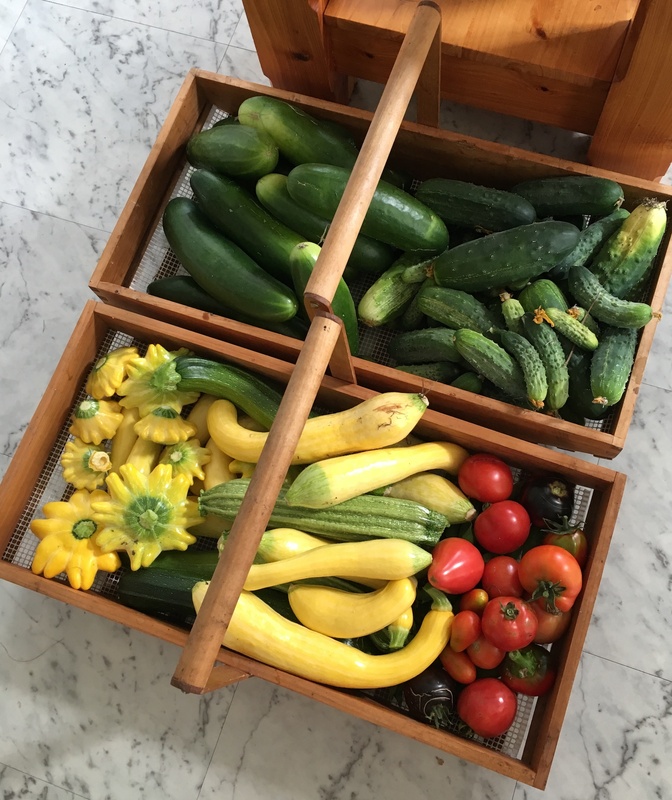 There are still plenty of summer crops coming out of the garden, but the equinox is a good time to evaluate what worked and what didn’t this past summer. Tomato Indigo Apple—I blogged about this beauty when it first began to ripen. It has proven itself over the season, producing plentiful, delicious and attractive fruits that ripened early and continue to ripen as other varieties are giving up for the year. Tomato Oxheart—This variety was also new to me this year, and it did well enough to deserve another go. The almost disturbingly heart-shaped (as in ox heart, not love heart) fruits were flavourful and plentiful. Onion Pearl Drop—Cute and fast-growing. I’ll plant these again. Watermelon Sweet Red—It might have simply been the weather this summer, but Sweet red matured more quickly and produced more fruit than Rapid Red, which I’ve planted in past years. I’ll be curious to see how it does in a cooler summer. Eggplant Container Pick—I was excited by this smaller variety of eggplant, as mine always end up pressed against the top of the low tunnel I grow them in, but these seeds didn’t even germinate. Tomato Russian Red—This isn’t a new variety for me. Usually Russian Red, bred for its ability to withstand and produce well in cool temperatures, is my best producer. This year, the plants spent most of their energy on vegetative production, growing to massive leafy plants without actually producing much fruit. And the fruit they did produce was so hidden in all the greenery that I missed half of it. It won’t stop me from planting Russian Red in the future, but it emphasises to me the need to plant a mix of varieties, as year-to-year differences in weather can make a big difference in production. Pole Bean Jackson Wonder—The jury is still out on this bean, but poor germination and slow growth mean I still haven’t harvested any of these lima beans. There are plenty of pods on the plants, but whether they will fill out properly before frost kills them is debatable. My guess is that in a normal summer here, they wouldn’t have a chance—they appear to need too long a growing season. Yard Long Red Noodle alongside scarlet runner beans. 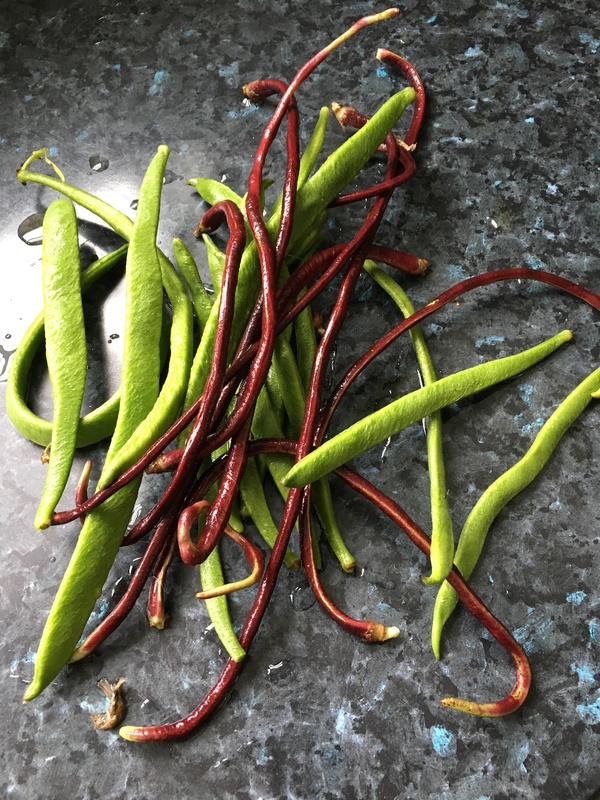 Along with all the other heat-loving plants that did well in this summer’s garden is the bean Yard Long Red Noodle (Vigna unguiculata—the same species as cowpeas). I have never had luck with these beans here in New Zealand—they are particularly sensitive to herbicide overspray, and also prefer it hotter than our summers normally are (ideal temperature for them is 30ºC). But this year, the plants germinated slowly, which spared them the springtime overspray, and the summer was hot and wet. I can’t say they’ve thrived (we grew yard long beans in Panama, and so I know what they’re supposed to grow like), but they have managed to produce a small crop of ridiculous-looking beans. The beans aren’t exactly a yard (90 cm) long, but they’re 30 cm (12 inches) or more, and are the sort of silly crop to make everyone smile. Their red colour is pretty in the garden, and unlike many other red or purple vegetables, they retain their colour when cooked. Good enough reasons for me to plant them, in spite of their poor performance here—a few go a long way. Most people give little thought to earthworms. Even gardeners, who appreciate their presence, don’t spend much time considering which species of worm are present. Here in New Zealand, we have about 200 species of earthworms, most of which are native. The native and non-native worms are sharply segregated by habitat—natives in native habitats, non-natives in agricultural and urban habitats. 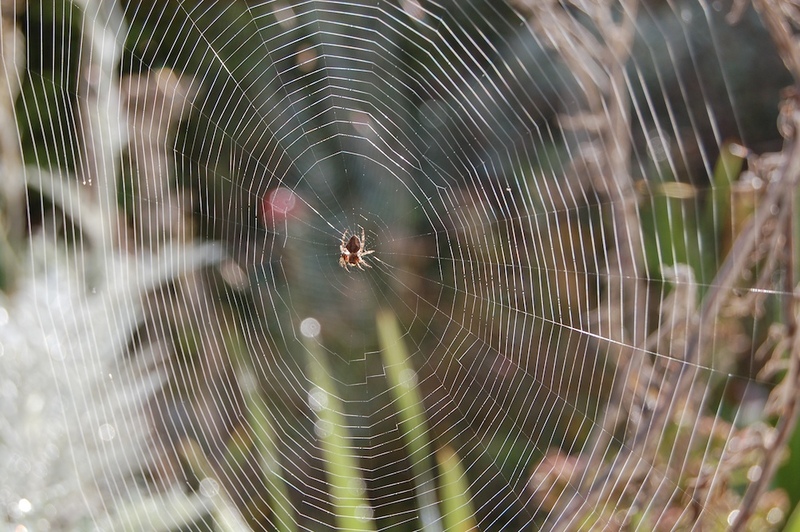 So all the worms we see in our gardens are non-native species. When you’re used to the small to medium sized non-native worms, finding a native worm is exciting. They’re generally larger than the non-native worms—sometimes much larger. Some can grow to nearly a metre and a half (59 in) in length. 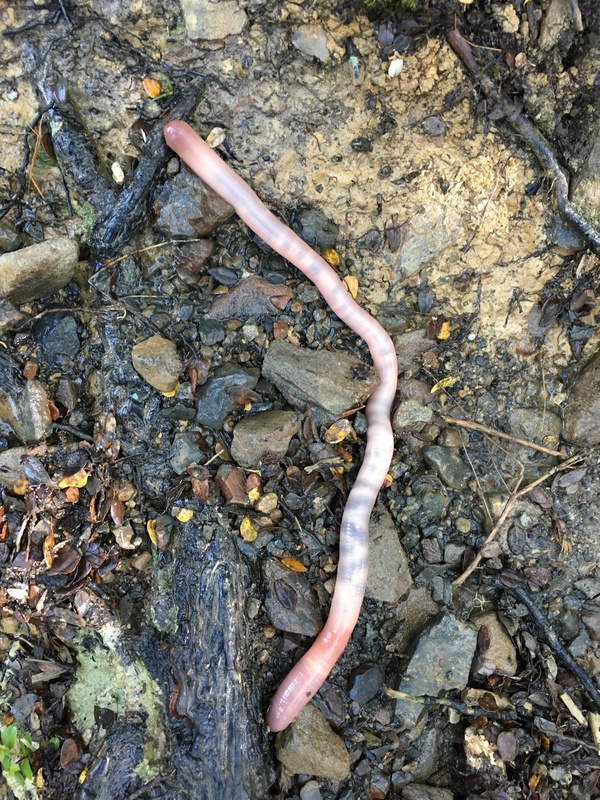 We were lucky enough to find this native worm on Mount Oxford over the weekend. I can’t positively identify the species, but it’s likely to be Octochaetus multiporus. This was a young specimen—not yet reproductive age (as evidenced by its lack of a clitellum)—but already about 20 cm (8 in) long and as thick as my pinky finger. This particular species grows to about 30 cm (12 in) long. O. multiporus is a particularly interesting worm because it is bioluminescent and spits a bioluminescent defence compound when disturbed. On the bright sunny day we found this one, there was no hope of seeing any bioluminescence. Still, it was a great find on our walk. A family hike on Saturday took us through a fungal wonderland on Mount Oxford. Everywhere we looked, it seemed, fruiting bodies were popping out. White, brown, blue, purple, red, black—fabulous diversity of species, form and colour. My favourite of the day, however, were not the big, showy Amanita muscaria or the lurid purple Cortinarius porphyroideus, but these unassuming (and unidentifiable by us) little shelf fungi. 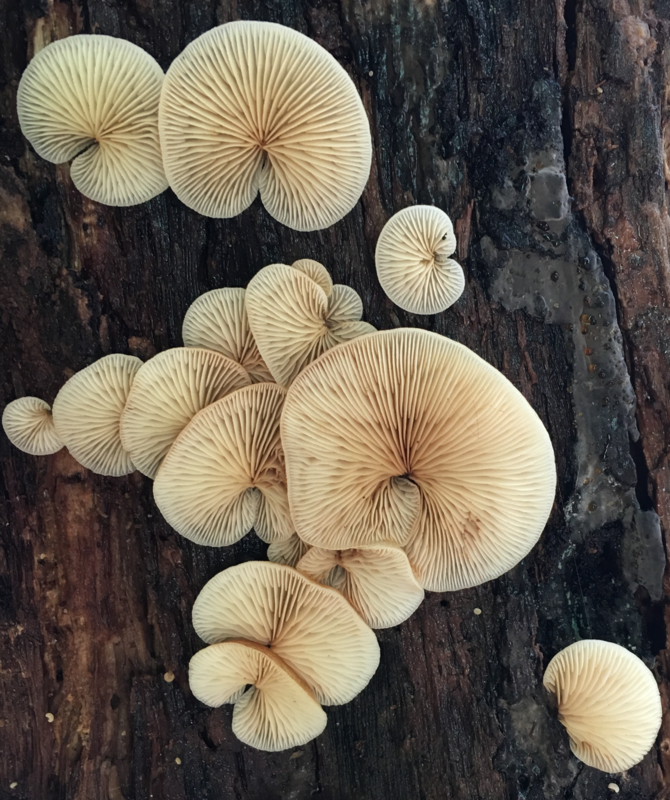 They were growing out of the underside of a fallen log we had to duck under, and their gills made stunning, artistic patterns. Unremarkable though the mushrooms themselves were, the perspective of seeing them from below turned them into something truly special. Amazing how a simple shift of perspective can turn the ordinary extraordinary.